This post has been sponsored by the Better Sleep Council, in the form of a new bed (yay!). No monetary compensation has been received and, as always, all thoughts and opinions are my own. Did you know that May is Better Sleep Month? Now, that is a holiday I can truly embrace. When was the last time you got consistently good sleep, where you slept sufficient hours at night and woke up refreshed and not sore or tired? I’m guessing that the last time I had consistently good sleep and enough of it was when I was a child. As a teen, I stayed up late doing homework and woke up extra early to go to a before-school religion class. Then I was off to college (does anyone get enough sleep in college?) and soon on to married life while still living the college life. I went straight from college to being a mom, and everyone knows that moms with babies don’t get enough sleep. I go to sleep around 11:30 pm each night – sometimes later, but rarely any earlier. I wake up at 5:50 am 5 days a week and sleep in until 8 or 9:00 am on the weekends. I work in my room. I know that having my bed right next to my work desk/computer is a big no-no, but I don’t have another room to put my office. Some of my most productive work is at night, after 9:30 (ie, after the kids have gone to bed). While I am often tired after dinner, I get a boost of energy and motivation because I am so productive in the evening hours. I have a hard time shutting my brain down for the night. I keep my iPad and cell phone on my nightstand at night. Checking emails and statuses are usually the last AND the first things I do each day. I’ve got chargers and an alarm clock that all let off blue or green lights in my room. I like sleeping with the windows open and often have nature and street noises and lights coming in through my windows (have you ever noticed how bright the moon is?). I prefer sleeping with some kind of white noise (fan, humidifier, or sound machine). Silence makes my mind go to over-time AND I notice the snoring more. Yes, there’s snoring, too. The result? I am often tired. I crave naps and hit a wall in the afternoon where I am not productive in my work at all. I don’t exercise enough (I’d rather sleep when I really should be going to the gym). Within the next week, I’ll be receiving a plan with personalized feedback about my sleep habits from registered nurse and sleep health and wellness professional, Terry Cralle. I admit that I’m a little scared to hear what she has to say about my bedtime routine, my lack of hours in bed, and especially about my bedroom home office space. As hard as it is to make changes, though, I do recognize that a comfortable and restful night’s sleep (that includes plenty of solid hours in bed) makes a huge difference in productivity, mood and over-all health. When I do, on occasion, get enough sleep, I have more energy and use my time more efficiently. While I know that this is the case, it’s still hard to make changes in my routine. I know I’m not alone in this! 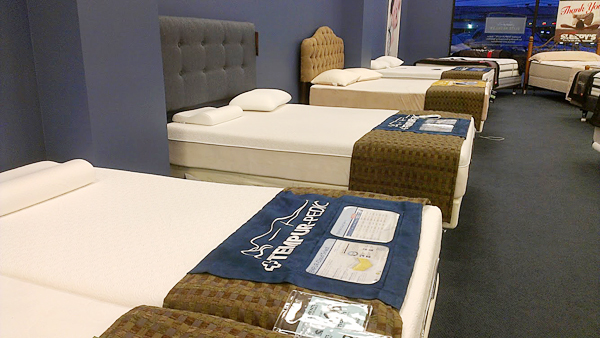 About a week ago, we headed out to a local Sleepy’s location to pick out the perfect mattress. The Sleepy’s employee who guided us to the right mattress was so helpful. We started out by taking their Bed Match “test” which helped the Sleepy’s mattress professional find the right kinds of mattresses to show us. 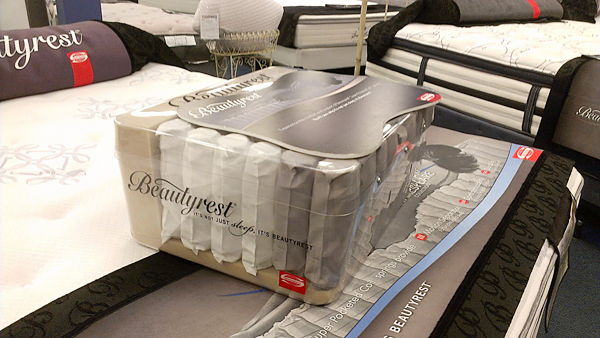 In selecting a mattress, she said there are a few basic questions to kick off your search. First, what size mattress? Then, what type of mattress (spring, foam, air, combos)? And, lastly, what sort of mattress top (pillow top, plush, Euro top)? I am personally drawn to pillow top mattresses (our helper described my preference as “marshmallow beds”). She had us lay on several mattresses for several minutes each, and she pointed out that typically when a customer has found the right bed, she knows it before they do because she can sense it in their face and body language. When you find a bed that fits your body and sleeping preferences, your body instantly relaxes. Making the final decision was not easy, but Sleepy’s was incredibly helpful in coming to our final choice. I’m hoping that implementing the personalized tips and suggestions from the Sleep Professional along with the better sleep from sleeping on a new mattress will transform my sleep. I’ll be reporting back in a few weeks to let you know how it has been going. Established in 1979, the Better Sleep Council (BSC) is a non-profit organization supported by the mattress industry. 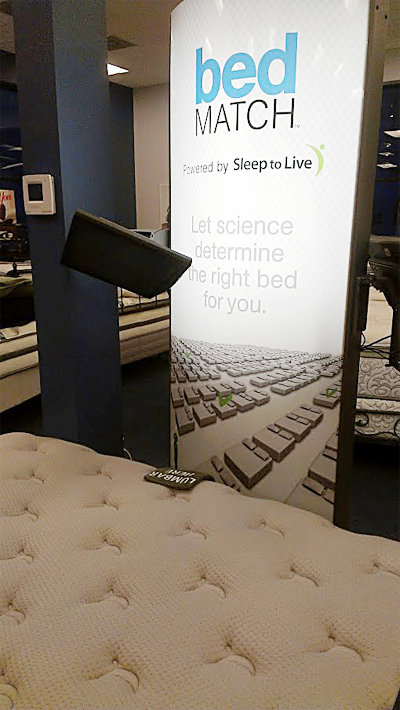 The BSC is devoted to educating the public about the importance of sleep to good health and quality of life and about the value of the mattress and sleep environment in pursuit of a good night’s sleep. Often, people will make everything else a priority before sleep, but sleep on a quality mattress is quite literally the foundation to be at our best each and every day. It is the BSC’s goal to “wake up” the world, and awaken them to the importance of sleeping 7-8 hours on a comfortable, supportive mattress. We all know how it feels after a bad night’s rest, and conversely, how we feel after sleeping great! Win a free mattress for Better Sleep Month! Be sure to enter the Sleepocalypse Sweepstakes. The prize is something you do not want to miss – a $2000 gift card to purchase a new bed! The sweepstakes runs through June 1, 2013. I definitely could use a new mattress set. Ours is only 10 years old and sinks down in the center. Yeah — I have NOT been lazy or anything! I think what happens is that we get used to the gradual changes (ie–the decline in quality of sleep) and don’t realize it’s bad til we see a contrast ro something happens. I know we need a new mattress. My husband and I both wake up frequently with backaches and still feeling very sleepy and unrested. Thanks for sharing the sweepstakes info!